Great crested newts are fully protected under UK and European law. It is an offence to kill, capture or disturb them, or to damage or destroy their resting places. This protection extends to the habitats that support them and often this means upto 250m or 500m from ponds. Surveys for great crested newts are formed of two stages. The first is an initial assessment of a habitat feature such as a pond and includes a standard assessment called a habitat suitability index. Ponds that are identified as having potential to support newts are then surveyed at stage 2. This second stage includes various methods of survey conducted in or around the pond to identify if newts are present. Stage 2 surveys can only be conducted between mid-March and mid-June. If great crested newts will be affected by the proposed works detailed mitigation may be required and a licence to undertake the work. The potential timescales for newt work should not be underestimated with seasonal constraints on both survey for the species and mitigation. Loss of ponds can add substantial time on projects to be able to identify suitable sites for creation of new ponds. Ecology by Design staff are unique in the industry that we can provide eDNA sampling techniques to enable analysis of a pond from a single visit. Please contact us for more information. We are often asked why great crested newts are protected. In short they are protected by law because within Europe the population is declining and within the UK we support a large proportion of the declining population. The population is declining largely due to a loss of ponds and suitable habitat. Determining the species of newt is important with three species commonly found in the UK including smooth newt (sometimes called common newt), palmate newt and the great crested newt (some times called the warty newt). The great crested newt is easy to identify compared to the others. Great crested newts are the UKs largest newt species, they are jet black or olive green with white warts and a bright orange belly with black spots. During the breeding season the males have a wavy crest along their back. Great crested newts are native to the UK and are widespread but patchy across the UK and absent from Ireland. Newts can occur both on land and in water and commonly occur in garden ponds. Individual newts are often found under refugia such as log and brash piles. There are generally three stages to a standard survey for great crested newts. The first stage includes an assessment of all ponds within 500m of your site. The assessment known as a habitat suitability index (HSI) takes into account ten variables such as pond size, shading and vegetation present to calculate a score/ category for the likelihood of the pond supporting newts. 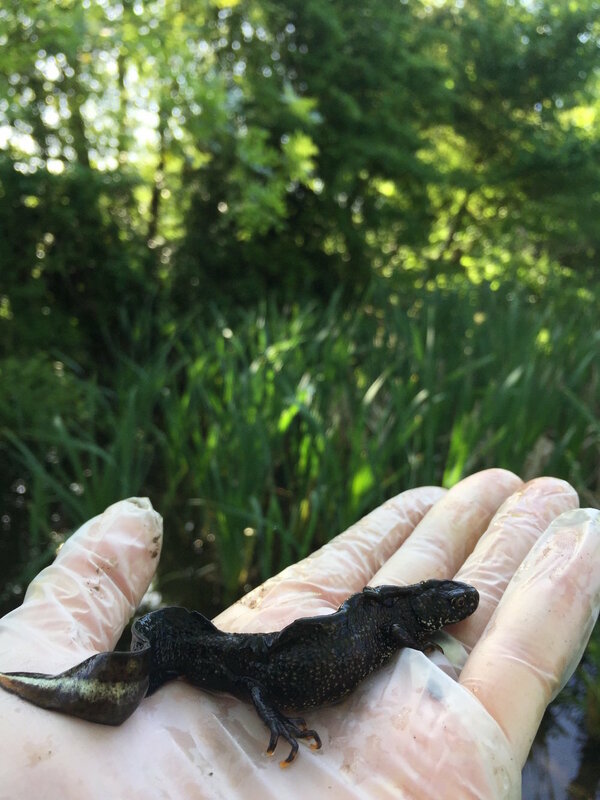 Taking into account your site, the pond HSI scores and habitats between them we then determine if a full great crested newt survey is required based on the likelihood of your work having an impact on great crested newts. A full great crested newt survey can be very intensive and involves surveying a pond on between four and six occasions using different techniques to record the presence or absence of newts. These surveys are constrained by the season and can only be conducted between mid-March and mid-June with at least half of the visits between mid-April and mid-May. If newts are identified in any of the first four visits the full six visits are then required. A new technique called environmental DNA (eDNA) can also be utilised and involves taking water samples from your pond and analysing the sample for the presence of newt DNA. This is much cheaper than a full survey but if newts are present a full survey (above) is then still required. EDNA is also restricted to the period from mid-April to the end of June. If great crested newts are identified on or within 500m of your site and any impacts on the species cannot be adequately avoided, a licence may be required to enable the work to proceed. Licences are issued by the statutory authorities; Natural England (England), Natural Resources Wales (Wales) and Scottish Natural Heritage (Scotland). Licences enable work that would otherwise be considered illegal following an agreed method to a given timeframe. Licences are legal documents and must be strictly adhered to. For some species including great crested newts there are also an alternative licence available called a low impact licence. This enables works on low impact sites to continue with a much reduced licence application/ site registration and with work undertaken in the presence of a consultant registered to utilise the licence. Mitigation for great crested newts can take many forms and is adapted to the project, landscape and timing.